For fast splicing and cool effects, you need a professional program. A flexible tool such as Flowblade would suffice. Almost unnoticed by the public, Janne Liljeblad has been putting some time into making a very interesting editing program for videos. With the Flowblade tool, amateurs can quickly bring a vacation video into form, while professionals can create broad effects and animation based on the available functions. Despite its slim size, the program provides more useful tools than many of its competitors. With Flowblade, you can arrange the clips on multiple tracks, create effects flexibly over so-called keyframes, and process numerous video formats. Even with this multitude of features, Flowblade provides a clear and uncluttered interface that simplifies getting on board. Somewhat more complicated, however, is the current installation of the Python software (see the "Installation" box). Because of its young age, Flowblade is still missing from the repositories of most distributions. Consequently, manual installation is de rigueur. As of this issue deadline, only a DEB package was on the home page that worked just with Ubuntu 12.04 and Linux Mint 12. With another distribution, you need to install the utilities through package manager. Table 1 shows the corresponding programs and libraries that Flowblade 0.6.0 requires. The package names refer to Ubuntu 12.10. Note that GTK, Cairo, and Python should be installed on most distros by default. Once you have everything ready, click the Downloads tab on the Flowblade home page  to grab the 6MB tar archive and unpack it in your favorite directory. Start the software with the command ./flowblade-0.6.0/flowblade in a terminal. Installation is unnecessary. If a dependency is missing, the program warns you in a terminal message. After startup, a large main window will appear (Figure 1). In the upper left corner are a few tabs that provide numerous effects for video completion. To the right is a black preview screen at startup. The bottom of the window has the timeline for assembling the finished video. Figure 1: The main Flowblade window is well organized, but it requires a lot of screen real estate; making it smaller won't work. Flowblade stores the current state of the work and its settings in a project file. To create an initial blank project, click File | New . Under Project Profile choose the video format. If you have a DV camera, choose DV/DVD PAL . If the camera records in AVCHD format, choosing HD is a good start, but your camera manual should tell you exactly which format to use. To assemble videos from different sources, use the drop-down list to choose the format in which you want to assemble them eventually. Creation of a DVD would most likely use DV/DVD PAL . Here, Flowblade adjusts the preview pane to the selected format, but not much else happens. The program creates a small preview icon for each uploaded video file. In the presettings, you determine which intermediary directory the clips should go into. Use Edit | Preferences to make the presettings. Click next to Thumbnail folder on Select folder and choose a suitable location on your hard drive. Flowblade doesn't identify the selected directory in the presettings, so you should keep track of it. Close the window by clicking OK .
Next, load all the clips you want to assemble for your video project. Ensure that the Media tab is activated in the upper left, then click Add above the pane to the right and select one of the clips in question. The clip will appear in the list on the Media tab with the preview icon and its runtime in seconds (Figure 2). Figure 2: The Media tab collects all the project video clips. The zingst5.avi clip is just 23 seconds long. Gradually drag all the other videos over using Add . Depending on the video file, this step may require some patience. Flowblade likes to pause unresponsively from time to time especially with HD videos, but the wait is definitely worth it. Once all the clips are loaded, you can drag them one at a time into the timeline at the bottom and organize them there. Often only a small part of each clip needs work; this is especially true for vacation videos where the camera is simply left to run. To crop a video in advance, double-click it on the Media tab to open it in the preview pane on the right. Use the buttons under the preview pane to navigate to the new starting point for the clip. The double arrows advance the clip at a faster rate; the arrows with the vertical line move one frame at a time. Alternatively, you can drag the orange vertical line under the preview pane to the left or right. This "scrubbing" method is effective in navigating smoothly through the video. HD videos can run pretty slowly through the preview pane under some circumstances – sometimes taking a few seconds per frame. A little patience (or a faster computer) is helpful here. As soon as you find the new clip starting point, click the play button. Move to the end of the new clip and click the left square bracket. The brackets also appear as guides in the white bar below the preview pane (Figure 3). Figure 3: Flowblade shows the clips demarcated by bracket symbols. The clip times appear just above the preview pane. Flowblade now takes only the parts of the clips between the bracket symbols. To correct any mistakes, you can simply redo the bracket settings or remove the brackets by clicking the button with the two angular brackets. A correct choice in an editing program can save you a lot of headaches when working with video clips. We compare several applications to help you choose the tool that's right for you. We compare seven free video editing programs, including Cinelerra, Flowblade, Kdenlive, Kino, Lightworks, LiVES, and Shotcut. Bring your videos into the limelight and turn your recordings into minor works of art with the OpenShot editing tool. In today's world, making a video clip using your smartphone or a low-cost digital camera is easy. The video editing programs Pitivi and OpenShot let you put together a film out of individual clips. 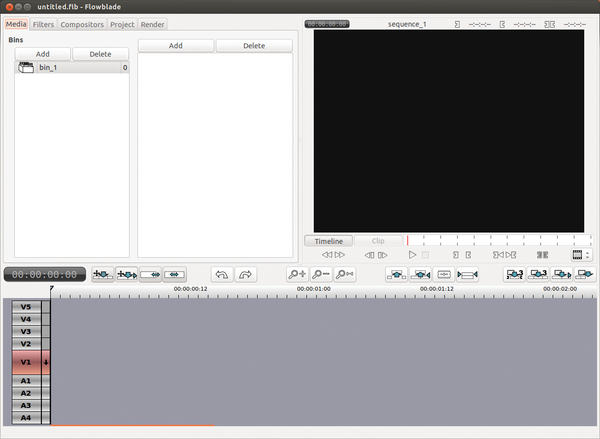 Video clip editors have been in short supply under Linux. Jonathan Thomas is now trying to fill that gap with the first stable version of the OpenShot Video Editor.